Does your home need a new floor that fits the design, is easy to maintain, and won’t need to be replaced for a long time? Our tile flooring has got you covered. With high-quality brands and a wide selection of porcelain, slate, and vinyl tile, there’s no style or décor that we can’t match. Feel free to bring in your vision, design plan, and any samples you have, and we’ll help you find the right choice for each room. From selection to installation, our professional flooring experts, designers, and installers are here to help. Our team knows how to find the perfect match for every customer who comes into our store. Besides its elegant beauty, there are a lot of advantages to tile flooring. Tile is strong enough to last for years if it’s well maintained, and keeping it well maintained is easy. All it needs is the occasional sweep or mop, nothing more. 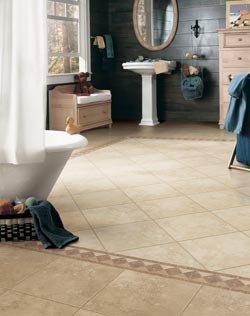 Tile withstands moisture, fire, frost, stains, scratches, and slips. The hard surface is especially good for pets, as it can stand up to sharp toenails and allows for easy accident cleanup. It’s also one of the best for resisting water, making it a popular option for kitchens and bathrooms. It even resists bacteria, germs, mold, and dust mites, so the room remains a healthy place to be. Wherever you put it, tile has so many different varieties and types that you’re sure to find the perfect fit for your home, your family, and your budget. Tile is not only good for families and pets, it’s also good for the planet. Tile does not release a single volatile organic compound, making for cleaner indoor air, and is made from recycled material. Vinyl Tile is a traditional favorite with a classic feel, one that’s been used in homes for hundreds of years and continues to be a popular choice. In this day and age, it has a design that’s flexible enough to go in any room. Whether you’ve got carpet or wood in your home, this product complements your décor beautifully. Our tiles are made of material that lasts and allows homeowners to get creative with their styles, so you get the floor that delivers in appearance, performance, and price. Not only does porcelain tile do well in high traffic and resist allergens and bacteria, it’s also one of the most versatile types of flooring. There’s no limit to the number of trim pieces and accents that you can use to customize your porcelain, and it can go in both formal and informal settings. We can even make it have the look of marble, natural stone, or travertine, so you get a rich look for a light price. If you’ve got children, pets, or just have a habit of getting water on the floor, our slate tile is another excellent choice. Slate is one of the most durable and strongest materials in flooring, and completely waterproof. It’s perfect for bathrooms, kitchens, and pool areas; you’ll never have to worry about spills again. When you want your floors to have a long-lasting look and lifespan, choose our professional tile flooring installation services. Our exceptional customer service doesn’t end when you’ve bought your flooring; we stick with it until your new floors are laid and ready. Each and every completed installation job is backed by our Ultimate Confidence Guarantee, so if any time there is an installation-related issue with your floor’s installation, we repair it free of charge. Tile installation allows for quite a bit of creativity that goes far beyond a basic square grid. We can install tile in beautiful patterns like brick and checkerboard. These popular designs add a new subway or retro look that is unlike any other. You can also get creative with a tile border. Tile borders are easy to make and let you add a unique touch to your design to truly make it yours. Plus, the simplicity of tile installation makes changing up the design easy, so your floor can keep evolving along with your aesthetic preferences. Contact us for tile that goes the extra mile. We’re happy to help customers in Bethlehem, Allentown, Easton, Hellertown, and Palmer, Pennsylvania, and the surrounding communities.